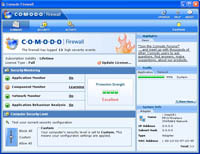 The new choice for free firewall protection, Comodo Firewall keeps hackers out and keeps unauthorized programs from accessing the Internet, even tricky ones that sneak around normal program control. And it resists being forcibly terminated. It works as well as all but the very best for-pay firewalls. Download directly from other server.